Story Contracting and Story Homes have both been ranked among Britain’s 100 fastest-growing companies in the Sunday Times BDO Profit Track 100. The national Profit Track highlights the fastest growing UK companies, with Story’s being in a unique position; having two companies ranked in the top 100 founded and owned by the same person. Story Contracting, which covers Construction, Rail and Plant divisions, has grown by 73% in the last three years and is ranked 33rd in the Profit Track league. House builder Story Homes was ranked 87th after profits increased by 46%. 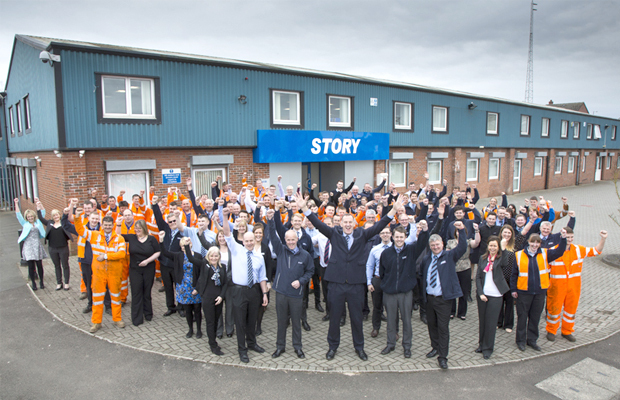 Story Contracting employs 412 people with bases in Carlisle, Yorkshire, Edinburgh and Glasgow. Story Homes employs 141. “This achievement is down to everyone who has worked incredibly hard over the last three years across the businesses. I am very proud of what we have achieved together. Both businesses have recently endured unprecedented change, not only has it been challenging, it has created a great position for both businesses to have a successful future. The Sunday Times Profit Track 100 covers privately-owned companies, as opposed to those listed on the stock market, highlighting companies whose profits have grown the fastest in the last three years. Both Story Contracting and Story Homes feature alongside 9 other companies ranked in the league from the North West. This is the 16th year that The Sunday Times has compiled the Profit Track 100.